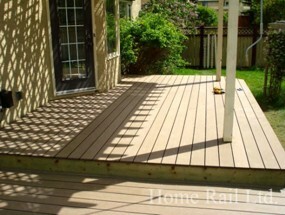 Edmonton Vinyl Decking: Home-Rail Ltd.
Visit our showroom today or contact us today to learn more. We understand how hard it is to find an aluminum railing suppler that provides aluminum rails that are maintenance free, durable, inexpensive, high quality craftsmanship, engineered & tested to exceed Canadian buliding codes, is easy to install, requires no painting and has a twenty year warranty. Home-Rail's aluminum railing systems have a lot to offer. 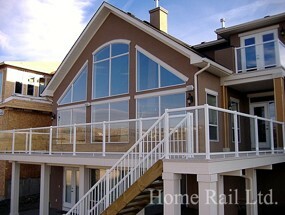 Visit our Calgary Showroom today to see all of our Calgary aluminum railing systems today. Home-Rail Aluminum Railing suppliers supply professional aluminum railing services and products in your local region of Alberta including Okotoks, High River, Calgary, Aldersyde, Longview, Heritage Point, Black Diamond, Turner Valley, Millarville, & De Winton. In addition we also supply regional depots in Vancouver, Calgary, Edmonton, Regina, & Winnipeg. We are experts in the following markets deck railing Calgary, deck railing Lethbridge, deck railing Medicine Hat, aluminum railing Medicine Hat, Lethbridge aluminum railing, aluminum railing Lethbridge, composite decking Lethbridge, Medicine Hat aluminum railing. Home-Rail also provides professional Railing & Decking installation and Railing & Decking supplies for other associated rail and decking industries such as Vinyl Decking, Composite Decking, Aluminum Fencing, Aluminum Decking, Deck Installations, Rail Installations, Stair and Staircase Building and Installation and decking and railing services and installation for large commercial construction projects in your local region of Alberta. Web Design by: High-Country Web Design Okotoks Alberta. Web hosting by High Country Web Hosting Okotoks Alberta. We understand how hard it is to find professional deck and railing supply and installation company; here are some of our websites you can use to learn more about the various products and services we offer. Alberta Foothills Guide: Community, Travel & Business Directory, Classified Ads, and Events for Okotoks, High River, Black Diamond, Turner Valley, Millarville, Bragg Creek, Aldersyde, and Longview.